One of the longest lasting promotional gimmicks in Nintendo’s history was releasing limited edition gold cartridge versions of Zelda games, which lasted right up until the N64. The carts were still plastic, though, and really only valuable for their limited availability. The new version of the Analogue Nt, however, is plated in genuine 24-carat hand-polished gold. And it’s being limited to just ten units, so there’s some added value in how rare this version of the NES clone will be. 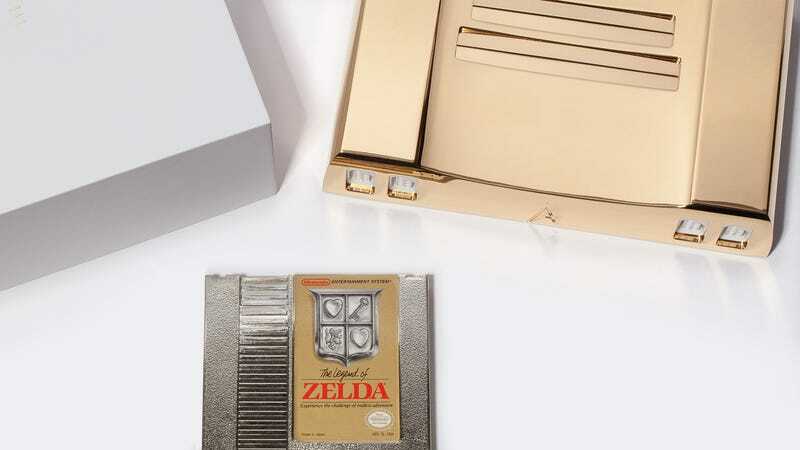 It even comes with an original gold cartridge version of The Legend of Zelda, but like previous versions of the Analogue Nt, it can also be used to play any of the classic NES or Famicom games you might still have kicking around. To further sweeten the deal on the 24K gold version of the Analogue Nt, all ten units also feature a transparent baseplate so you can peek inside at the electronics powering your efforts to rescue Princess Zelda. But is it enough to justify a $5,000 price tag when the standard version of the console is $500 instead? You might want to consider just grabbing yourself a can of gold colored spraypaint.